The Bruce N. Chaloux Scholarship for Early Career Excellence was established in recognition of our former CEO, Dr. Bruce N. Chaloux, who was devoted to supporting leaders in online learning. Watch for applications opening in mid-summer 2019. This scholarship recognizes individuals achieving extraordinary accomplishments in the field of online education at an early stage in their careers. Presented annually, this scholarship is presented to individuals forty years of age and younger who have made significant contributions to online education. Nominees should be known for leadership activities, service to the profession, scholarly publications, and/or contributions to advancing the field. This award consists of OLC Accelerate conference attendance, three nights at the conference hotel, a $300 travel stipend, and a commemorative plaque. Leadership Activities: The nominee has demonstrated leadership in the field of online education at the institutional, local, regional, national, and/or international level. Service: The nominee has performed a significant number and variety of activities that demonstrate service to the field of online education and its constituent community. Contributions to Advancing the Field: The nominee’s work has contributed significantly to the overall advancement of online education. Scholarly Research and Writing: The nominee has published work that has increased knowledge, and/or contributed to improving practice for the scholarly and/or practitioner communities within the field of online education. Supporting Letters: The supporting letters address the nominee’s achievements in the field of online education. A detailed description of the nominee’s individual achievements related to online education and how they fulfill the award criteria. At OLC, we continue to strive to accelerate online learning worldwide. It is with this in mind, that the Bruce N. Chaloux Fund was developed in 2014 and has since provided several recipients the opportunity to attend OLC Institute courses or one of our conferences and events where otherwise they would not have been able to attend without your help. Through this scholarship fund and your donations, we can help your peers to excel in online learning and drive student success. Whether providing professional development in online learning through courses offered by our OLC Institute, or enabling first-time presenters the chance to share their knowledge and experience with us at our conferences, your donations will help us advance excellence in online learning and empower educators in need. Our scholarship fund typically supports recipients from less well funded and endowed institutions in the United States and from around world. 100% of all donations support the scholarship fund and go directly to the costs of supporting the scholarship recipients. Funds are not applied to any other OLC initiative. OLC is a tax-exempt 501c ©(3) nonprofit organization.Our tax ID # is 26-1970287. Your gift is tax-deductible as allowed by law. FROM MEG BANKE, FORMER PRESIDENT OF THE BOARD. It is impossible to adequately put into words what Bruce Chaloux meant personally and professionally to each of us. He was more than the energetic CEO of our consortium; he was our good-humored, kind and generous friend. He was an optimistic and dedicated leader who spent his last days doing what he loved: pushing hard for online and adult learning opportunities here and around the world. His accomplishments are many, his networks extensive, and his unfinished business is still at hand. Bruce led Sloan-C, currently the Online Learning Consortium, as an international organization dedicated to the growth, expansion and integration of online learning into the mainstream of higher education. In 2010, Bruce was named to the Inaugural Sloan-C Fellows. Bruce has also been engaged and recognized by other professional associations for his advocacy work. Most recently this year, Bruce was honored by the NUTN advisory board with their highest honor, the Distinguished Service Award. He was to have been posthumously inducted into the International Adult and Continuing Education Hall of Fame in November 2013. Previous to serving as CEO of the Online Learning Consortium, Bruce served for fourteen years as the Director of Student Access Programs at the Southern Regional Education Board (SREB) where he founded and oversaw SREB’s sixteen state Electronic Campus which now includes 2000 degree programs from 300 colleges. During this period he was on the board of Sloan-C and became the organization’s second president. His efforts to coordinate the Sloan Semester, an initiative to serve learners impacted by Hurricane Katrina in 2005 demonstrated the potential of online learning and were a highlight of his career. Bruce also led extended campus programs at Virginia Tech. 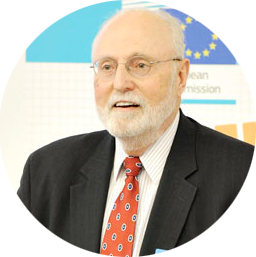 Bruce is remembered for his significant achievements in impacting policy to promote online and lifelong learning. Bruce has been a leading advocate for practitioners to have impact on state, regional and national problems and issues and has led engagement with our communities. Bruce has continued advocacy for online learning, most recently contributing at the national level to enhance reciprocity between states for online learning, having recently been named to a national commission for implementation. Bruce lived his life enthusiastically and fully. His engaging spirit endeared him to everyone he met. His quick wit, smile and genuine interest in people won over all who he met. Bruce leaves a huge hole in the many organizations and relationships he served, and he will be dearly missed. In order to honor Bruce’s legacy, let us agree that “there will be no end to the good Bruce Chaloux has done!” As Bruce would enjoin, “there is much to be done!” and we can keep that spirit alive! As many know, Bruce was particularly enthusiastic and committed to helping to build and develop the next generation of online education leaders. He was instrumental in launching the Institute for Emerging Leadership in Online Learning. Bruce’s commitment to building the next “cadre of leaders in online learning” was a passion and vision he was deeply committed to.